McCarthyism is the practice of making unfair allegations or using unfair investigative techniques. Or in the case of the City of Belmont McCarthyism can be found in Lieberman's unethical code of conduct aimed at restricting dissent or political criticism. John Dooley and Larry Fortado are suing the San Mateo County Harbor District after Fortado's fish buying business was ordered to relocate a controversial hoist. 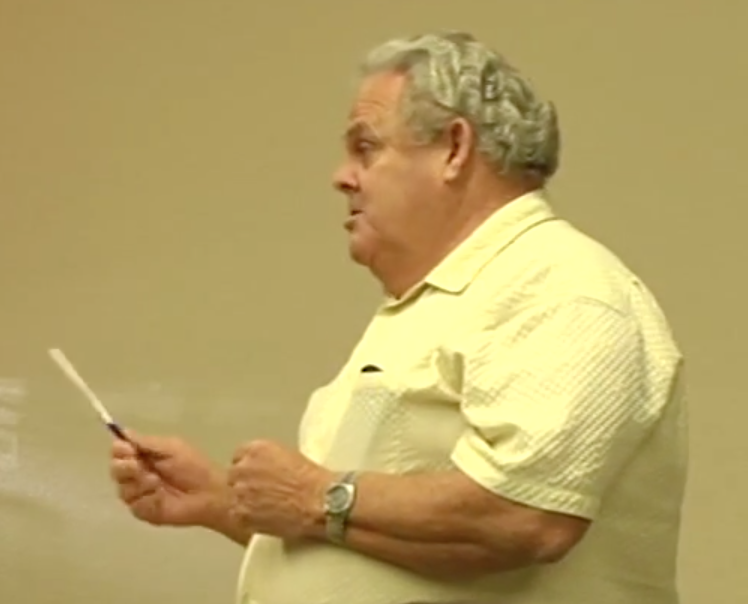 John Dooley is paying Fortado's legal fees because Dooley stands to profit from the hoist. Larry Fortado, owner of Three Captains Sea Products, filed the lawsuit in San Mateo County Superior Court on Tuesday, June 4, 2015 alleging loss of income because he was denied use of a hoist he installed to offload fish from boats at Pillar Point Harbor. Larry Fortado and his not so silent business partner John Dooley are mad as a hornets nest because a group of fishermen turned them in for neglecting to apply for a Coastal Development Permit for the hoist. After Coastal Commission staff met with fishermen a permit waiver was pulled off a 2014 Coastal Commission meeting agenda and a full permit was required. Three Captains neglected to provide the Coastal Commission with a complete permit application before or after the hoist was installed. In 2015 the Harbor Commission passed a resolution that denied renewal of a one year probationary hoist agreement. Larry Fortado and John Dooley swore to get even and filed a meritless lawsuit. Pacific States Marine Fisheries Commission (PSMFC) filed a complaint against Three Captains' Sea Products on Feb. 10, 2010 in San Mateo County Superior Court. 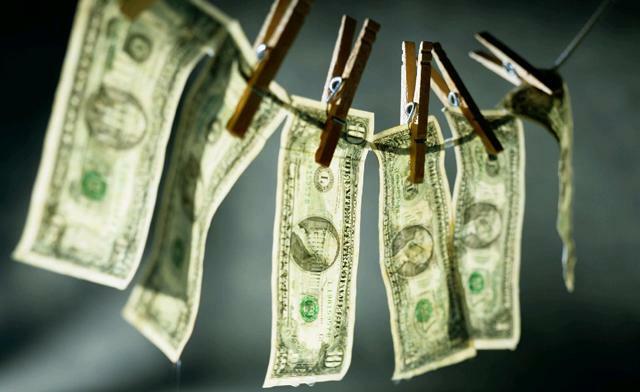 The claim for relief included $120,097.27 in damages. PSMFC made an administrative error in 2008 and 2009 while issuing checks for the California Salmon Disaster Relief Programs. PSMFC inadvertently double paid Larry Fortado, owner of Three Captains' Sea Products. The total amount of the overpayment was $120,097.27. PSMFC and their attorneys sent Larry Fortado letters seeking reimbursement on July 31, 2009, Sept. 30, 2009, November 18, 2009 and Dec. 29, 2009. After a jury trial was demanded Larry Fortado paid back the federal disaster relief money he owed PSMFC. 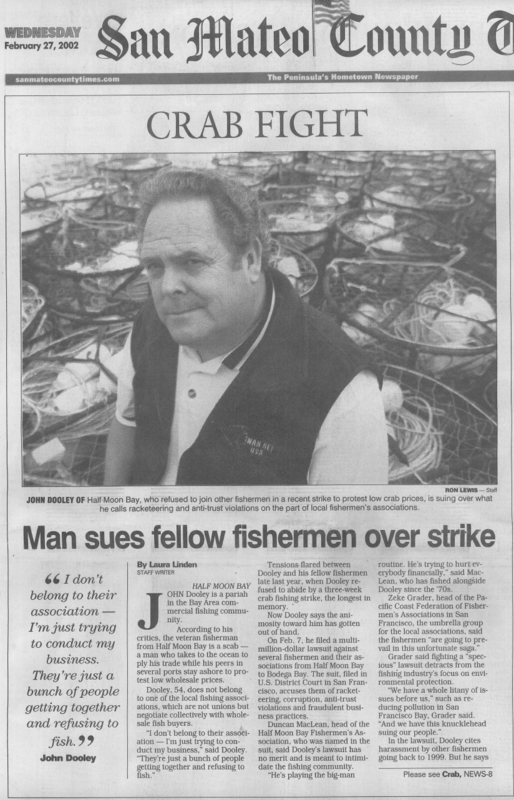 "Scowling at 'scab crab' / One fisherman breaks strike -- most hold fast"
Read Finance Director Debra Galarza's Tort Claim filed against the Harbor District on Sept. 11, 2014. It appears Galarza will seek "an amount not yet ascertained." We've learned that Jim Tucker was overheard bragging to Peter Grenell at Peet's Coffee on Burlingame Ave. Allegedly Tucker said he instructed Galarza to file a Tort Claim against the Harbor District. If true this might be good reason to censure Commissioner Tucker. By encouraging what appears to be a frivolous lawsuit it looks more and more like Tucker is unwilling to put the best interest of the Harbor District ahead of his open hostility towards Commissioner Brennan. We wonder how much this will cost tax payers? The following comments are from the Half Moon Bay Review.